Since we posted the review of the Sony HW10, readers have been asking how it stacks up against the Panasonic AE3000. They are both excellent home theater projectors. Both offer rich, vibrant pictures high in color saturation. However, there are some differences between them that will be important to some buyers and not to others. There are subtle differences in picture quality characteristics, and some not so subtle differences in features. Let's put them in perspective. Lumen output. When they are both calibrated to deliver their most accurate video images, the Sony HW10 is somewhat brighter than the AE3000. On our test units, the HW10 measured 697 lumens when optimized for video while the AE3000 measured 566. So the HW10 has the edge in this regard. However, the AE3000's maximum lumen output is quite a bit higher than that of the HW10. While video optimized mode on the HW10 tops out at 697 lumens, the projector cannot significantly increase brightness from that point. Meanwhile, the AE3000 has Normal mode, which on our test unit measured 792 lumens. Normal mode still has a very good color balance, so you don't sacrifice much in the way of color dynamics by using this brighter mode. The AE3000 also has a Dynamic mode, which measured 1273 lumens. With nearly double the maximum light output of the HW10, the AE3000 can be used for video gaming with the lights on, or perhaps for watching HD sports broadcasts. There are occasions when one might prefer to have some light in the room while using the projector - sometimes I like to have dinner while watching a movie. With some ambient light in the room I am less likely to drop my mashed potatoes in my lap. Thanks to the extra brightness, the AE3000 is better suited for this type of use than the HW10. Contrast. In terms of contrast, the AE3000 and HW10 are pretty much evenly matched, with the AE3000 having a slight advantage. Our AE3000 gave an ANSI contrast reading 446:1, while the HW10 registered 416:1. With respect to Full On/Off contrast, the AE3000 is rated at 60,000:1 contrast compared to the HW10's 30,000:1. Despite the huge numbers, this is actually a rather small difference in visible contrast on the screen, since a subtle change in black level can create a large swing in on/off contrast numbers. Nevertheless, while the HW10 has very deep black levels, the AE3000's are a bit deeper still. The AE3000's slightly higher ANSI contrast and incremental edge in black level combine to make it appear to be a little bit higher in contrast than the HW10. Color. Out of the box, our AE3000 was close to the 6500K color standard, though colors did appear oversaturated. The HW10 was slightly more difficult to calibrate, as the Medium color temperature which we used as a starting point required some tweaking to bring it closer to the 6500K standard. After calibration, either projector will give you well-balanced and well-saturated color, though getting there can be more of a chore on the HW10. Sharpness. Neither the Sony HW10 or the Panasonic AE3000 are quite as sharp as Mitsubishi's new Diamond Series projectors, the HC6500 and HC7000, which stand out as the sharpest of the 1080p projectors we've seen this fall. However, there is nothing soft about either the HW10 or the AE3000. When viewed alone, they look razor sharp, and it is only in a side by side viewing that the Mitsubishi units show an incremental advantage in sharpness. Between the AE3000 and the HW10, the actual sharpness of image is about equal. 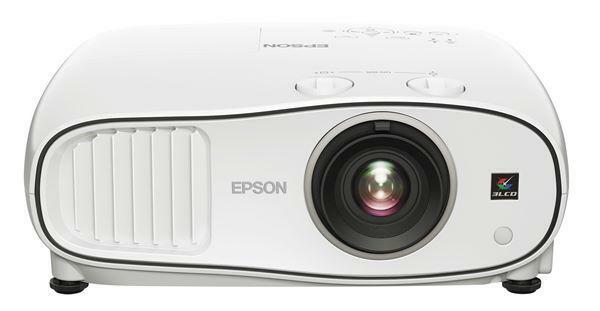 But due to the AE3000's small edge in contrast, the AE3000 can appear to be the sharper of the two projectors. Digital noise. Both the AE3000 and HW10 are relatively low in image noise when compared to other competing 1080p models. Both projectors have noise reduction options, but they were quite pleasant to watch even with the noise reduction filters turned off. We don't see an advantage of one over the other when it comes to noise artifacts. Placement flexibility. The AE3000's 2.0:1 powered zoom and extensive manual lens shift (three picture heights and two picture widths) are among the best in its class, and allow it to display a 100" diagonal image from 10 to 20 feet. The HW10 has a 1.6:1 manual zoom, allowing it to throw the same 100" diagonal image from 10 to 16 feet, and manual lens shift of 2.4 picture heights and 1.38 picture widths, which falls short of the AE3000's range. Of course, the longer zoom of the AE3000 has a downside. The AE3000 loses 41% of its total light output at the telephoto end of the zoom. So if you are in video optimized mode, its 566 video optimized lumens drop to 334 lumens. Meanwhile, the HW10, at its maximum telephoto zoom setting, loses only 22% of its total light output. That means its 697 video optimized lumens drop to 547 when using the long end of the zoom lens. Thus, while the AE3000 gives you more zoom range at the telephoto end, it comes with a penalty in light loss that you might not want to pay. Lens Memory. The AE3000 has a Lens Memory feature, designed to imitate the performance of an anamorphic lens through manipulation of the projector's powered zoom capability. While this concept has been around for years, the AE3000 is the first projector to automate the process and add one-button simplicity. The HW10 is capable of accomplishing this same function, but you have to do it all manually every time you switch between 2.35 and 16:9 material. If you have no interest in 2.35:1 super-widescreen cinema or already own an anamorphic lens, this is a moot point. However, if you want to go with the 2.35 screen format and don't want to spring for an anamorphic lens, the AE3000 gives you some very important ease of use that the HW10 does not. Frame interpolation. One of the hot-button features this season is frame interpolation. That is the ability of a projector to create interim frames in a video signal to reduce or eliminate the appearance of motion judder (for a discussion of judder and how frame interpolation reduces it, see Evan Powell's article on the subject). Simply put, the AE3000 has an option to activate its "Frame Creation" systems, while the HW10 has no such feature. While not everyone appreciates frame interpolation - indeed, some people think it compromises the "cinema experience" - we feel that it is among the most important innovations in home theater projectors since 1080p. If you are among those who don't care for it, it is a non-issue in deciding between these two projectors. Comparisons like this one are often exercises in nit-picking, as it is becoming increasingly rare to see glaring flaws in home theater projectors these days. The Sony HW10 and Panasonic AE3000 are both excellent home theater projectors that will serve their owners well. The key advantage of the HW10 is that its picture is somewhat brighter when both projectors are calibrated for ideal contrast and color performance. The key advantages of the AE3000 are slightly higher contrast, the automated Lens Memory feature for 2.35 operation, and the optional on-board frame interpolation system. It is up to you to determine which of these features are most important to you. Whichever you choose, you will end up with a beautiful picture in your new home theater. What about panel alignment? Hit-or-miss convergence is the one area of 3LCD technology that remains a problem. Doug - you are correct that 3LCD has a lot of problems. I don't know why we keep getting reviews on obviously outdated and flawed technology. And don't even get me started on LCoS (response time 1000 microseconds compared to DLP's 1 microsecond). There is a service menu adjustment for the HW10 to enhance black level reproduction under auto iris. It involves a setting which close down the auto iris fully on a 0% stimulus/IRE gray full field test pattern. Informal contrast ON/OFF contrast measurements with the adjustment indicate the a potential doubling of the manufacturers stated 30K:1 CR potential. I have documented the service menu adjustment on the AVS forums under my screen name Bytehoven. I invite you to explore the calibration to see if it improves your HW10 black reproduction performance. Thanks again for your 11/07 HW10 review and the 11/15 HW10 / AE3000 comparison. Why do you guys keep quoting manufacturers contrast ratings and not your own? I mean you take the time to measure lumens & ANSI but not the full on/off? Are you hiding something or just being lazy? If you did I would think that would be a plus to the HW10, considering Cine4Home measured 13,000:1 with DI @ D65 on the PT-AE3000 and in Jason's review on AVSForum, he messured 24,353:1 @ D65 on the VPL-HW10. Which of the two projectors has lower fan noise? Although the manufacturer's noise ratings are similar, is one projector actually quieter than the other at close range (my projector needs to sit on a shelf right over my head - so fan noise is a really big deal). M.Gibson, we're going to continue to get reviews for 1080p 3LCD projectors because it's the only technology available at the $2.5k or less price point. I've owned three 3LCD projectors and while yes, they are not perfect...it's what most of us can afford to have. I've so far have never had any serious problems with panel alignment...maybe I'm lucky. :-) However, I still get rainbow effects from the latest single-chip DLPs. Let's not sound too elitist by criticizing folks who still value what 3LCD designs have to offer. This site is catering to the J6Ps of projector enthusiasts. The harder it is to tell the difference, the less difference it makes. Some of you guys have your "discrimination" skills virtually hardwired so that you are convinced that any difference you can find (visibly discernable or not) is a make or break proposition that any fool should be swayed by. The pictures on these projectors are staggeringly good. Buy either one (or several others reviewed here and elsewhere) for price/service/resale as the primary concerns and you will be grinning like an idiot when you get it fired up on a good screen. I've had a bunch of projectors for the last 25+ years. We are nearing the point of complete practical fungibility. And that's because: The harder it is to tell the difference, the less difference it makes. How is it possible that the lumen output in best mode for the ae3000 is so different between the review here and the review on projectorreviews.com. 402 lumens vs 566, that's a pretty significant difference. M. Gibson - Actually, I own a 3LCD projector. I can sit far enough from the screen to not see minor misconvergence, but I'm very susceptible to single-chip DLP rainbows. I've heard a 4LCD projector is coming very soon which will answer a lot of the quibbling complaints expressed by videophiliacs here. I dunno how good a movie theatre seems now in comparison to almost any projector. Seating generally isn't ideal, for example, and I recently had to endure a woman loudly laughing through all the philosophical expositions of a film I attended. M. Gibson. The reason we get so many reviews of 3LCD is to show that the so called flaws in 3LCD have been overcome and that pictures are now better than on many DLP projectors. Whats more I expect that unless there a some large price cuts from DLP Manufacures they will start losing market share to the likes of the Panasonic forcing themselves into a "High End - High Price" corner for people with M.M.T.S. This comparison doesn't include noise. given how similar the visual quality is, how about some mention of that other important sense. HW-10 is measured to be much quiter than AE3000 (by a memeber in finnish AV forum). In fact HW-10 was marginally quieter than Mitsubichi HC7000! I am VERY DISAPPOINTED taht these new projectors are not using the revolutionary new invention of LED light instead of bulbs that's already out, and which other companies have already started using. Its actually cheaper to build and operate - there would be ZERO noise practically, no fan system, no bulbs to replace, etc etc. Whats going on???? Why are they still using bulbs and fans? single chip DLP has A LOT of issues and it is IMO more outdated and flawed than LCD/LCOS. Really need help from expert. I have Marantz VP12s2, should I change it to Pana PT-AE 3000 ??? With the 3000u witch way is brighter , full zoom on a 100'' 16:9 or no zoom with the projector set back more on the same 100'' screen? I got the chance to view both projector side by side for about 30 mins watching the same test material - Dark Knight on various scences. My view is that the Sony is better in showing off the shadow details. And the shiny day scene looks like cloudy days on the Sony as well. It seems to me that the Panny provide more consistent performance of the 2. (my choice). I've owned an LCD projector and a few DLP projectors. From my experience: All LCD projectors will get dust in them (impossible to seal the optical engine). So while they look great at first, those dust specs and blobs show up after a few months and drive me crazy: Never buying an LCD again. DLPs do cause rainbow effects and although they have been minimized w faster + multisegment color wheels I can still see them when panning left to right but my NEC HT1000 has never been cleaned and still looks great(nodust). Conclusion: I'd prefer a DLP sealed optical engine over LCD. So how about D-ILA or SXRD (same technology, new name) well at least they are like DLPs in that they can seal the optical engine. And with no color wheel : no rainbows so is this the best of the bunch? Would seem to be ... I'm Looking at the Sony and JVC models. Anyone have one of these for more than 6 months? : How do they stack-up LONGTERM?? Very good and interesting comparaison, however I would like to know if the Sony HW10 also can accumulate dust like the PT-AE3000U? If so is it complicated to clean like the panny. The reason we keep having reviews of 3LCD is because they are a more abundant technology (and far improved). There are other technologies out there (Led,OLed) buy they are not mature yet and are VERY costly.